If I’m completely honest with you, today’s post nearly didn’t make it as a Meet The Designer one today. You know when you discover something refreshingly new and innovative, and you find yourself thinking about it 24/7? That was and, still is me, from when I came across Isabel Quiroga’s Back-To-Basic Desk at the London Design Fair. However, ALL of her designs captured my eye and imagination and I couldn’t let you miss out on this talented designer and her highly practical and functional designs. I have, of course, included the desk for you all to swoon over too. If you’re looking for unique and innovative designs that work with you as an individual and are more than just a pretty picture, you’ll definitely in the right place today. Studio Isabel Quiroga’s creative designs have it all and more. But first, as always, a little bit about the designer herself…. My work can be characterized as innovative combined with practical functionality. Graduating from the ‘Academie Beeldende Kunst & Vormgeving’ in Enschede, The Netherlands, Isabel Quiroga has received several nominations for awards and acquired the Applied Arts Award for her design The Low Lands. Balancing imagination with functionality, Isabel’s designs stand out in form and function. Her work has been exhibited all over Europe and published worldwide in magazines, design blogs and books. As a designer of innovative products such as the Back To Basic Lamp above, Isabel translates her ideas into multifunctional objects. It’s important to her that her designs are unique in character and thereby distinguishing them from the mass-produced. I love that her designs have been carefully thought through. Each piece offering versatility and personalisation. These attributes really shone through at the London Design Fair. The experiences I have whilst assembling I use directly to adapt the design, which results in a changeable object. Always looking for unconventional solutions to add value, Isabel uses the assembling of her designs as an important part of her creative process. Balancing their originality and fancifulness with their functionality. A new design of Isabel’s is the Back to Basic desk. I personally think this should be titled the Perfect Desk or Even Desk of Dreams with it being love, at first sight, and all. Unlike most conventional desks where you are presented with the usual surface area to work upon, and maybe a drawer or two to hide away your desk essentials, the Back to Basic desk provides versatile functionality to your actual working area where everything can be to hand. It’s a design that has been recently reworked and was inspired by the Back To Basic Lamp. Simple holes and notches offer the possibility to attach any other office tool that is needed. For instance, there’s a steel board to put notes on with the help of magnets. Such items as tape dispenser and a mobile phone holder are to hand and made out of folded brass. The all-important desk lamp that provides task lighting can be arranged anywhere along the desk. A great idea as sometimes light doesn’t always fall where you want it to. The desktop itself is made out of solid ash wood and carried by a blue steel tube construction. Oh, and for those items, you’d rather not have on show, there is a drawer too. New features have been added to this desk which aims to provide elegant storing solutions. Objects often difficult to organise, such as wrapping paper and wires or chargers, can be arranged onto the brass tubes and springs which are now part of the Back to Basic desk. As someone who likes to draw, especially when designing, the rolls are perfect for storing larger rolls of paper. Or you could house wrapping paper so it’s always to hand. Wires of chargers and laptops are another problem we all contend with and one that Isabel has thought through. Her desk is designed so that they can’t slip away by using a spring mechanism on a brass plate. Overall this design combines functionality and aesthetics in a surprisingly simplistic manner. Designing and assembling is my passion in life. For me, it is telling my story through images. I’m waiting patiently for this desk to become available to buy so will have to continue swooning until then. Treetable was also showcased at the London Design Fair. It combines a table with three movable tops each made from different materials and sizes, which are moveable and exchangeable. Additionally, this design incorporates accessories, holes and notches, which make it adjustable to multiple uses. These offer possibilities of storing working and decorative objects, pens and pencils, cards and pictures. A vase and a mirror are already attached. I’m thinking hallways, bedrooms and dressing rooms for this beautiful piece. Another new design shown was Isabel’s Inside Vase. Made from hand-blown vibrantly coloured glass, this vase provides you with two different looks. Designed to carry a single flower but also a bouquet, Inside Vase is comprised of a glass tube inside another. The layers of colour intertwine providing a decor that can be enjoyed even on its own. 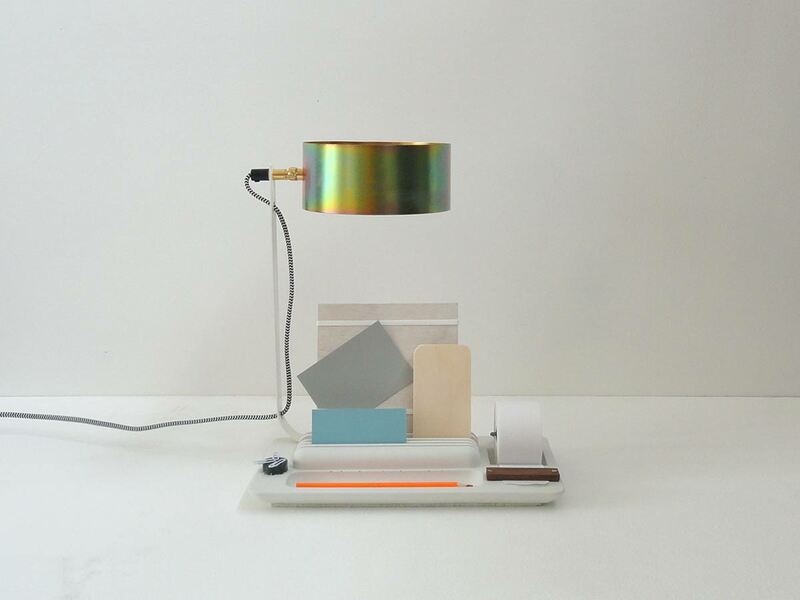 The Back To Basic Lamp started its life from Isabel collecting leftovers from a previous project. Instead of throwing them away, a new design came about which has now turned into a series of desk lamps. Each lamp is unique and can’t be reproduced. This series of desk lamps are made out of concrete. The lamp helps you to organise your desk and to keep all the important thing’s within easy reach. It’s more than just a desk lamp offering some ideal practical features. From somewhere to put your pens and notes to built-in paper roll for those all important lists that we all make. These are available to buy so if you find yourself unable to wait for the desk or prefer this form or organisation you might want to have a look here. I think you’ll agree that Isabel has managed to combine functionality and minimalistic design that provides maximum functionality with timeless qualities to her designs. These attributes ensure their longevity that you will continue to enjoy no matter what the latest trend. If you’ve fallen in love with these unique designs for your home, there’s plenty more for you to enjoy over on Studio Isabel Quiroga. You can find out more here. I do think more of us are taking time to pause and give thought to what we buy for our homes. Rather than the bargain buys that are bought on a whim and later discarded, we are taking time to find something unique. That one piece that has been lovingly crafted, fulfils its function and is beautifully formed. Today may have offered you the inspiration to go find that something that will make your hearts and your homes sing! Until next time! Thanks for stopping by….